How Big is a Giraffe’s Heart and How Does a Giraffe Get Enough Blood to its Brain Through its Long Neck? The giraffe heart is quite a powerful pumping machine. A giraffe’s heart can weigh up to 22 pounds and about 2 feet long in size. It must produce about double the normal blood pressure compared to other large mammals to maintain blood flow to the brain. The giraffe’s heart has to be big enough to counter gravity and feed the brain at the top of the giraffe’s long neck, which can sometimes be as long as eight feet. Some bigger giraffes have hearts that weigh up to 29 pounds or more, and they pump three times harder and more efficiently than the human heart. 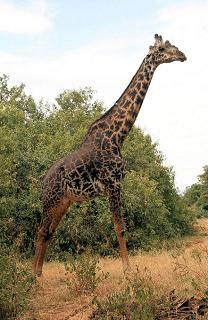 How Long is a Giraffe’s Neck and How Many Vertebrae Does a Giraffe Have in its Neck? How High Is the Blood Pressure of a Giraffe and Do Giraffes Get Heart Attacks and Strokes? How Does a Giraffe Give Birth to its Offspring and How Big is a Baby Giraffe When it’s Born?